Possibly the most exotic state, Louisiana enjoys a multicultural and multilingual heritage because of the French, Spanish, African and Native American cultures that have blended since the 17th Century. Oil and natural gas reserves can be found abundantly, and tourism plays a big part in the state’s economy, especially in New Orleans. When incorporating in the Louisiana, foreign entrepreneurs should feel confident knowing that their personal assets are protected. Corporations and limited liability companies separate the assets and liabilities of companies from the personal assets of the business owner. In many instances, forming a company is the first step for a non US resident to open a bank account. A US bank account gives businesses access to a debit card, and the potential to open a merchant service account. Internet commerce is made much easier with a US bank account because companies like PayPal, Amazon and EBay considers you more qualified as a vendor. Louisiana requires that a C corporation or an LLC must not have a name that is the same or could be confused with a business already in existence. To make sure your business name is eligible Inc. Plan can help you choose a unique C corp or LLC name. A unique corporate name enhances your company’s reputation and also helps protect the identity of your brand. The type of business entity you choose to incorporate in the State of Louisiana determines the nature of the taxes your company will be subject to. C corps are assessed taxes based on the net income of the business and LLCs will be subjected to taxes based on its members personal income return. The state requires both C-Corps and LLCs to have a Louisiana registered agent and office if they want to conduct eligible businesses here. Before your firm can operate legally in Louisiana make sure you possess all the required business licenses, permits, and tax registrations. If you need assistance, Inc. Plan can help you meet compliance requirements and also provide qualified registered agent service. Corporations and LLCs in Louisiana must have at least one owner/member. There are not any age restrictions on who can own and operate a corporation or LLC. The names and addresses of the owners of corporations do not need to be listed in filing documents with the state. LLCs are required to list the names and addresses of its members in the initial report at the time of incorporation. LLC names are allowed to end with the terms “Limited Liability Company”, “Limited Company” or the abbreviations “LC”, “LLC” and “L.L.C.”. Names including terms regarding banking, loans, insurance, savings, architecture and engineering, need approval from the Office of Financial Institutions. Any use of the words “State” or “Security” is prohibited. If you decide to incorporate an LLC in Louisiana, then the report you are required to file is called Articles of Organization. Additionally, Louisiana-based LLCs are required to submit an initial report at the time of incorporation. The name and address of a registered agent which resides in Louisiana, and which is available to manage legal and tax business documentation must be included in the initial report. For more help with the incorporation filing or for registered agent services contact Inc. Plan (USA). Louisiana LLCs are taxed based on the personal income of the controlling members. However, LLCs can choose to be taxed as partnerships or C corporations. LLCs that elect to be taxed as C corporations will also be subject to a franchise tax. 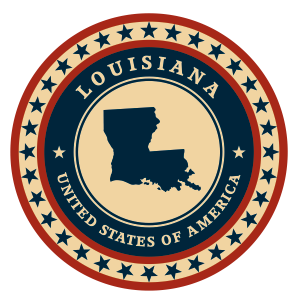 The organization names allowed in Louisiana must include the terms “Corporation”, “Incorporated” or “Limited”, along with their abbreviations. The designations “Company” or “Co.” are allowed if they are not preceded by “and” or “&”. However, any names including terms regarding banking, loans, insurance, savings, architecture and engineering need approval from the Office of Financial Institutions. Any use of the words “State” or “Security” is prohibited. In order to form a corporation in Louisiana entrepreneurs must file Articles of Incorporation with the state. A report of incorporation must be filed in the county of incorporation with the initial filing. The state also requires an annual report which must be submitted on the anniversary date of incorporation. The Articles of Incorporation must list of the company’s authorized shares along with their par value. The name and address of a registered agent with a physical Louisiana address must also be listed but in the initial report. Inc. Plan (USA) can help you with the necessary filings and also with finding qualified registered agent service. The state imposes a corporate income tax on net income at a rate varying from 4%-8% depending on the business’ annual taxable revenue. Additionally, C corps must pay a franchise tax due on the first day of the taxable year. The franchise tax is calculated based on the share stock, undivided profits, borrowed capital and surplus.